Original Air Date: August 8th 2010 @ 8pm EST! Good news! Amanda Oakleaf Cakes is going to be on the Food Network Challenge! We filmed this episode back in March and the theme for the challenge was Dora the Explorer. It’s a really, really exciting episode; so be sure to tune in! And in addition to the premier airing on August 8th @8pm, the show will also be syndicated on August 9th @ 3am & August 11th @ 7pm. 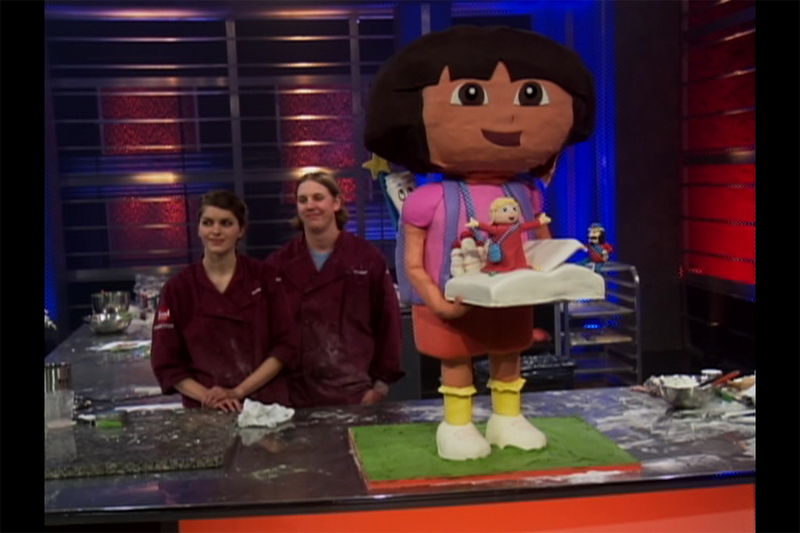 Below is a pic of Tyler and I with our finished, 4-foot tall Dora the Explorer cake. We did it, we did it, yay! In the mean time, if you’re really chomping at the bit to watch something, below is my original audition tape for the show. you are awesome! Your cakes look amazing!!! Can’t wait to see you on the Food Network. That is the coolest thing I’ve seen in a while!! I LOVE the last few seconds 🙂 Also way to give some love to us former Cold Stoners! Jerry and Sandra would be sooooo proud of you! Amanda , you’re so amazing..good job! Walked by a few times – very attractive window display – also ate sanp. of straw. cheesecake – delish ! Tell Tyler to listen on FB to my nephew Arthur’s music, The Mood – he’s local also!